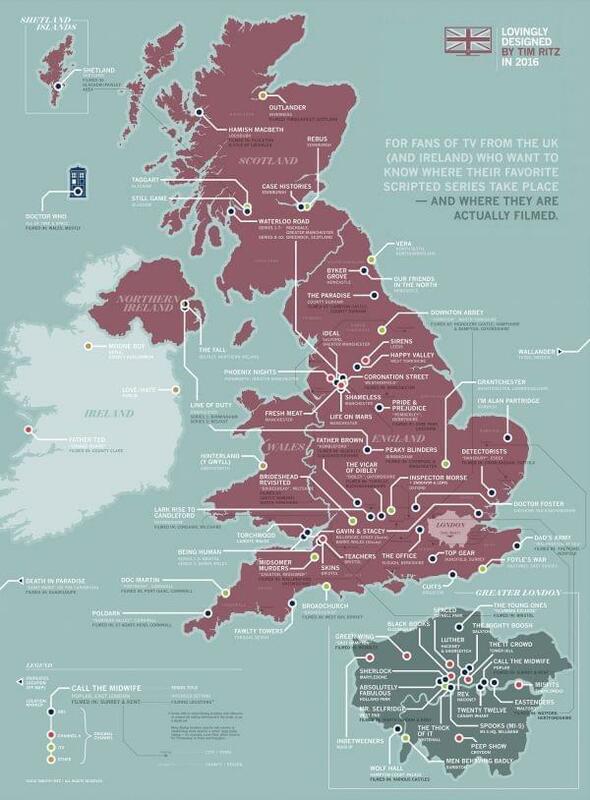 How to find your favorite British shows on a map. Every once in a while, I see something that makes me think, "This is what the Internet was meant to do." Most recently, it was this map of the British Isles by artist Tim Ritz. As he tells it, it began when his wife asked where exactly the mystery TV series Foyle's War was supposed to take place. Soon, his sketch of the U.K. included imaginary places such as Downton Abbey and Pride and Prejudice's Pemberley. Eventually it became a full-fledged art print pinpointing both the fictional and filming locations of dozens of television shows. I think it's fun to be able to place Dibley, Portwenn, Brideshead and Craggy Island, though I do feel obliged to mention a few omissions. Holmfirth, the real-life town in which Last of the Summer Wine was set, would be in the middle of the map, near the West Yorkshire location of Happy Valley. Hyacinth Bucket (pronounced "Bouquet") from Keeping Up Appearances lived in the non-existent town of "Fuddleton," but her house was in real-life Binley Woods, a little east and south of Peaky Blinders on the map. And while Ritz writes that Doctor Who is filmed in "Wales, mostly," it's more specifically centered in Cardiff, same as its spin-off series Torchwood. You can get a much better look at the map over on Ritz' web site, and even purchase a print if you want to hang it on your wall.